Unique and spacious floorplan in the Royale Palms at Kingston! Welcome to our beach home - unit #1208 Royale Palms! We are 5 minutes from Tanger outlets and a short 15 minute drive to Broadway or Barefoot Landing. Our floorplan provides fabulous oceanviews from our spacious balcony which can be accessed directly from our living room AND the master suite! Our enormous balcony is 160 square feet, making perfect for morning coffee or a fun outdoor family brunch! You'll find that our condo is spacious with 1,825 heated square feet. *Granite countertops in the kitchen. *Granite vanities in all bathrooms. 2 chairs and an umbrella set up daily by the lifeguards from 9am - 5pm on the beach from Memorial Day to Labor Day. We anticipate that our "home away from home" will soon become a place that your family revisits year-after-year! The Royale Palms high-rise is located at Kingston Shores; a sister property of Kingston Plantation...Myrtle Beach's Premier 145-acre, oceanfront resort! Royale Palms is Kingston's newest building which was built in 2007! The Royale Palms conjoins to the prestigious Hilton Hotel! While staying in our condo...our guests can access the gift shop in the lobby of the Hilton Hotel, Cafe' Amalfi, The Royale Day Spa (for an additional fee)...and the "owners' pool" at the Royale Palms. (*Please note that our guests do NOT have access to the on-site Splash! Waterpark, pools/pool decks at the Hilton Hotel...as these amenities are available ONLY to guests who rent directly through the on-site rental program/Hilton Worldwide. Thank you for your understanding!) Our guests can access Kingston Plantation's on-site Sport & Health Club for an additional fee. Fees begin as low as $10.00 per day, per person and are paid directly to the Sport & Health Club at the time of use. Please note that our calendar is current and up-to-date. Thank you! Beautiful ocean views from our 12th floor balcony! Fresh bedding & linens will be provided to each guest. Our beds will be made with fresh, clean sheets prior to each guests' arrival date. Once you have your parking pass from security...you will park in the Royale Palms parking garage. Our guests will have access to wireless internet (WiFi) during their stay with us...free-of-charge to you! Bath towels and kitchen linens will be provided. However, we ask that you please bring your own beach towels as they will NOT be provided. Thank you! Our guests can access the on-site Sport & Health Club during their stay for a separate fee. Fees begin as low as $10.00 per day, per person and are paid directly to the Sport & Health Club upon use. Take elevator from lobby to 12th floor! Dining area seats six...you can find additional seating at our bar height countertops...with three bar chairs. Cable is provided by Spectrum. Beach toys and beach chairs are located in the front closet. Arcadian Shores Golf Course is just 1-mile from Kingston Plantation...so, be sure to book your tee times quickly and early! Our guests can access the Royale Palms' OWNERS POOL during their stay with us! Our guests do NOT have access to the Hilton Hotel pools and pool decks. Vikki is great and very helpful. The condo is beautiful with lots of space. The only negative that my family experienced, they were working on the building and started at 7:45 in the morning. The pool was closed because of this. And I could not find the hot tub. Thank you for letting us use of your condo. We will definitely be back. A great time in a great place! Vikki and Steve are the best, their Sand Castle on the Beach at Royale Palms is in the heart of everything you need. Her unit provides everything one would want for A Home Away from Home experience! We thoroughly enjoyed our January Stay! Thank you for your kind words. We hope you will choose 1208 Royale Palms on your next Myrtle Beach vacation. Nicely furnished, had a great stay! Loved the condo, it had everything we needed. It was a little dusty and the corners weren’t as clean as they should be, but would stay here again. The communication with the owner was easy and timely. Thank you for your review. We notified our cleaning staff of your comments and hope this will not be an issue going forward as they are typically extremely conscientious. 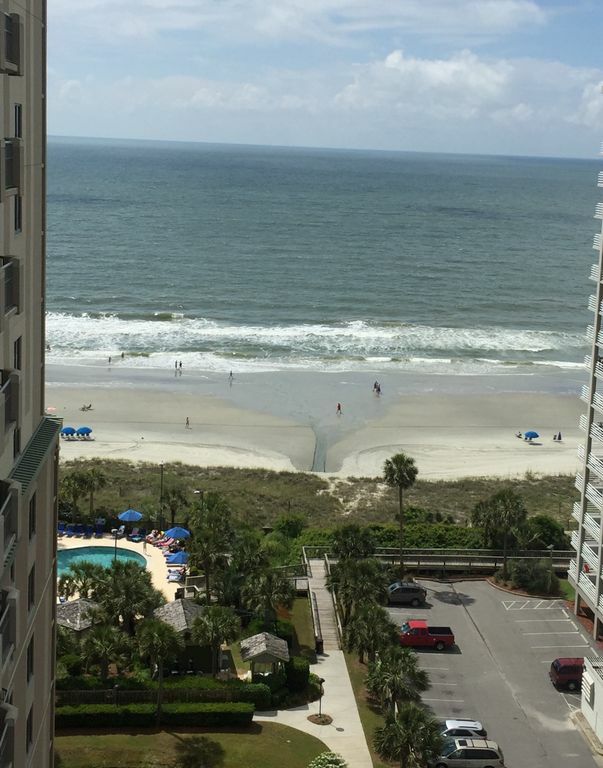 We hope to have you back on your next stay in Myrtle Beach. The condo was spacious and very nice. Convenient to shopping and restaurants!! This condo had everything you needed plus more. Cleanliness, kitchen supplies, even a huge amount of beach toys! Royale Palms is located in Kingston Shores...a sister property of Kingston Plantation! Both are in the very HEART of Myrtle Beach...with easy access to all main attractions from movie theaters, live theater (Alabama Theater, Carolina Opry, Pirate's Voyage), outlet shopping and even local conveniences such as grocery stores and restaurants galore (approx. 1-mile from Myrtle Beach's "Restaurant Row")! Nothing quite like being so close to all the FUN the Grand Strand has to offer! We require a 50% deposit (half of the total rental rate charged) and refundable damage deposit of $50.00 be paid upon booking. The additional 50% (outstanding balance) and separate departure cleaning fee of $125.00 are due 30-day prior to your check-in/arrival date. Thank you! *NOTE: Check-IN time is 4:00pm, EST and later...NO EARLY CHECK-IN's and check-OUT time is BY 10:00am and NO later. These time frames are set to provide ample time for our housekeeping staff to prepare for your arrival as well as the guests who will arrive after your departure. Thank you in advnace for your understanding and cooperation!